Excitable Educators: EEK! Presenting to your peers. EEK! Presenting to your peers. Cluster...network...communities of schools... there are so many names given to groups of schools working together to improve student outcomes, teacher and leadership practices. We have been part of the Naenae network for over a decade in its various forms and there is rarely a day we are not thankful to be so. It is a pleasure to be party of a team who are reflective, willing to take risks and show growth mindset in action! 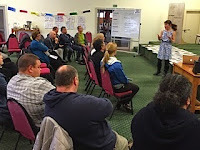 Early in 2014, a group of us from different Naenae schools were lucky enough to spend a couple of days being shown around the Manaiakalani network of schools in Auckland. Many things struck us and made us think. One thing we came back excited about was how the Manaiakalani schools met regularly to grow their learning together through cross network PL & D sessions. We suggested to the Naenae leadership team this was a great idea for cohesive thinking and they agreed. So in 2014 we started having cross network sessions, initially one per term. We have had a couple of sessions based around our Learning & Change Network priority change areas of Active Learning and Future Focused Learning. In year groups across different schools, teachers shared what successes they were having in these areas and what they were doing. We talked about ideas, resources and importantly, we got to know each other a little. This year we have planned for two network get-togethers a term. The first was led by Karen Melhuish-Spencer, from Core Education, which got us thinking about inquiry learning, future focused education and active learning. She got our juices flowing for the start of the year. The second one involved teachers running workshops based on teacher interest and included ALiM, blogging, active learning, and how to use Twitter. 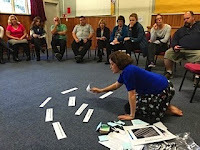 This term, it was suggested by principals that we share what Akoranga o Naenae was about and what we have been doing. *We wanted it to be relevant for everybody: would those teachers who didn't have students at AoN see the relevance of what we were doing in relation to their practice? Could we show with clarity the transference of our practice to different (younger) age groups? *Did we even have anything interesting or useful to say? We talked. We planned. We practised. We hoped! And as everyone started to appear, we worried! Thankfully most feedback has been positive, saying what we did was practical and useful. Teachers have been asking for some of the resources. Phew. It's really hard presenting to your peers and colleagues. As a network we are focused on building collegial, trusting and growing relationships and we have already learned so much amazing stuff from each other. And we know how cool it is to hear from other teachers. But it still doesn't remove the fear or nerves that comes with sharing what you do with others.